Keith Tudor is an Professor of Psychotherapy at Auckland University of Technology. He is a qualified social worker and psychotherapist, a writer, and an activist. His previous experience includes active membership of Big Flame (a revolutionary socialist organisation); Bush News (a local West London community socialist newspaper); being a volunteer with/ally of La Lega per il Diritto al Lavoro degli Handicappati [The League for the Right to Work of Disabled People], Milan; and a co-founder and member of the Sheffield Male Violence Project. Since 2009 he has been is a member of Ngā Ao e Rua (a bicultural group of psychotherapists and health care providers), and an associate member of Waka Oranga (an organisation of Māori therapists). He is the editor of Psychotherapy and Politics International (Wiley-Blackwell, Oxford, UK), and the co-editor, with Alayne Hall of Ata: Journal of Psychotherapy Aotearoa New Zealand (The New Zealand Association of Psychotherapists, Inc., Wellington, Aotearoa New Zealand). 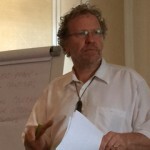 He is the author and editor of 12 books including The Turning Tide: Pluralism and Partnership in Psychotherapy in Aotearoa New Zealand (LC Publications, 2011), which offers a critique of statutory regulation of psychotherapy from a post-regulation landscape. He is currently working on several critical projects including: (with Max Farrar and Kevin McDonnell) Big Flame: Reappraising the Politics of a Revolutionary Socialist Organisation (Merlin Press); Psychotherapy: A Critical Examination (PCCS Books); and a short series on Radical Therapy.